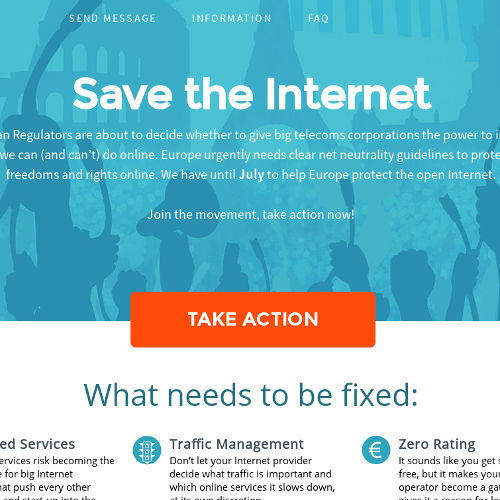 This website is an archive of the net neutrality fight in Europe from 2013 to 2016. If you are looking to engage in the ongoing political debate about upload filters in the EU Copyright Directive, you might want to check out pledge2019.eu. The fight against upload filters is as much about keeping the internet free and open as the battle for net neutrality. 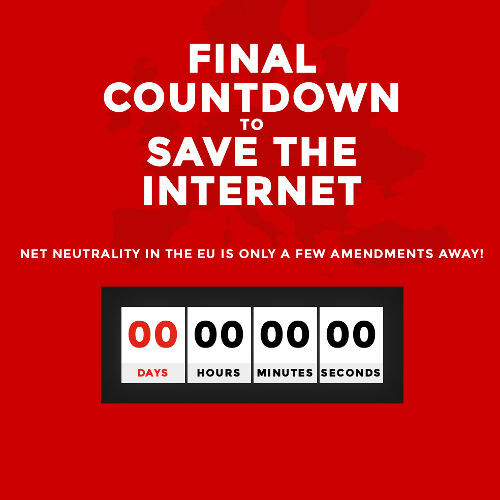 SaveTheInternet.eu wants to thank everyone who participated in this outstanding effort to protect net neutrality in Europe and keep the Internet free and open! Internet wins, thank you! In this campaign hundreds of thousands of Internet users banded together from 2013 till 2016 to keep the Internet free and open. 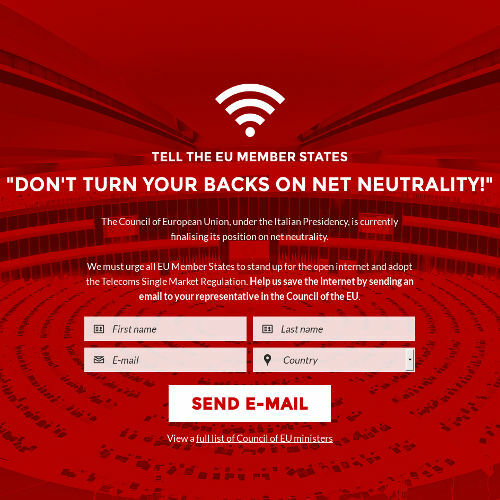 Together, we sent a loud, clear message to the European Institutions: protect net neutrality. And it worked! The final rules, which were published on 30 August 2016, offer some of the strongest net neutrality protections we could wish for. So long as these new rules are properly enforced by national telecom regulators, they represent a resounding victory for net neutrality. The public has made clear that will not leave the future of its digital public space to big telco lobbyists, but wants to decide for itself. To that end, civil society has to stay watchful and observe that telecom operators don’t violate the new principles. The consultation came as the final step of a legislative process that was launched in September 2013. During the ensuing three years, the SaveTheInternet.eu coalition campaigned successfully for the Regulation on which the BEREC consultation was based. SaveTheInternet.eu wants to thank everyone who participated in this outstanding effort to protect the free, open Internet! Thank you! If you want to help keep the movement for a free and open internet strong, please consider a donation. 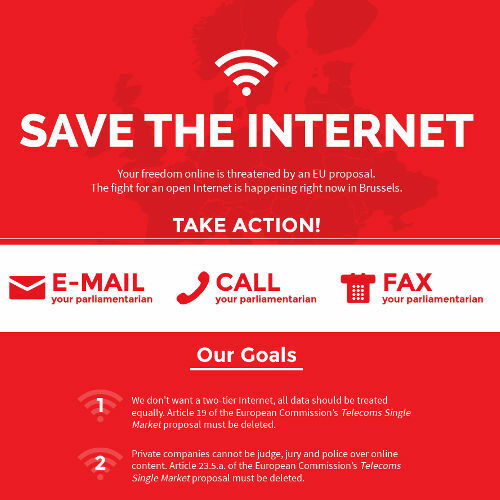 This is the first verison of savetheinternet.eu which offered tools to contact Members of the European Parliament via fax, phone and e-mail to convince them to uphold net neutrality in the Telecom Single Market regulation. It was launched at the 30th Chaos Communication Congress on 27 December 2013. EDRi, Initiative für Netzfreiheit, Digitale Gesellschaft, Access Now, La Quadrature du Net, Bits of Freedom and Go Veto are the founding members of Save The Internet (EU). Savetheinernet.eu was redesigned for the first reading plenary vote in the European Parliament. The public could rely on the same contact tools to reach out to their representatives. Reporters Without Borders joined the coalition. Together with the energetic voice of the public, this strong coalition convinced the European Parliament to vote by a a big majority in favor of strong net neutrality safeguards that protect the free and open internet. Open Rights Group, Info House, It-Pol, Xnet and Start-ups for Net Neutrality joined the fight. Savetheinternet.eu had to adapt to the 'trilogues'. 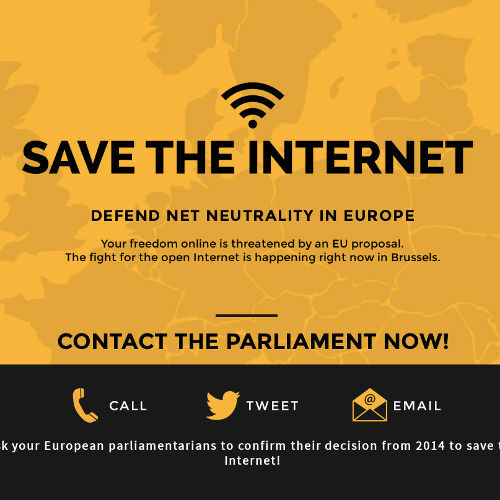 This period was even less transparent than the previous one.Still, SaveTheInternet.eu tried to put pressure on the representatives of the political parties in the European Parliament, the Council and the European Commission. We provided a timetable about all the meetings that we were informed about and offered users to send e-mails, call their representatives or write them on social media. We analysed all versions of the negotiated legal texts, held a protest in Barcelona in front of the headquarters of one of the largest telecom companies and debunked the main arguments of the telecom companies in an animation video(original). The trilogue agreement was ambiguous and contradictory in certain points. The campaign had to keep going. After the Council officially approved the trilogue agreement, the text had to be adopted by the European Parliament in second reading. 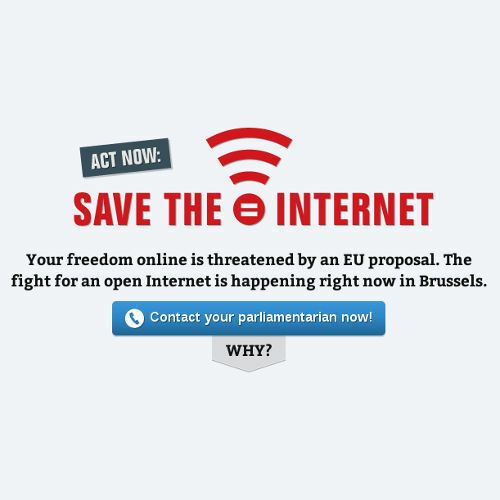 Accordingly, SaveTheInternet.eu was updated to highlight the urgency of the final vote before the law was passed. We proposed amendments to improve four unclear points. All of our amendments were tabled. A broad coalition formed that included startups, academics, journalists, media associations and thought leaders like the inventor of the world wide web Sir Tim Berners-Lee, Barbara van Schewick and Lawrence Lessig. SavetheInternet was projected over Telefonica's building in the center of Barcelona before the vote. However, we did not reach an absolute majority for the amendments which would have brought clarity to the text. The EU Regulation was passed, leaving it up to the telecom regulators to fix the uncertainties of the text Some days after the final vote, several organizations from SavetheInternet.eu gathered in the Free Culture Forum 2015 where a new campaign strategy was planned to work closely with BEREC and the national regulators during the guidelines drafting process, and building means to facilitate citizens’ contribution in early stages of the process. The EU telecom regulators gathered within the Body of European Regulators of Electronic Communication (BEREC) was tasked to write Guidelines for the unified EU harmonising the implementation and enforcement of the net neutrality Regulation. For this step, the campaign citizens could write their opinion on net neutrality in the form of a questionnaire and send it to their regulator. This was acompanied by an in-depth analysis of the legislation that showed how to deliver real net neutrality within the letter of the law, meetings with many regulators, a professional explanatory video, a demonstration in Vienna and a mapping action in Barcelona around the plenary meeting where the draft guidelines text was decided. The BEREC draft Guidelines were open for to discussion in a public consultation that was held from 6 June to 18 July 2016. 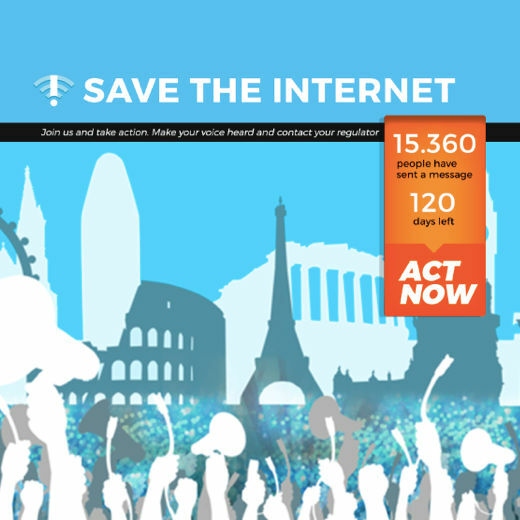 Users could participate in this consultation and almost 500,000 people from all parts of Europe spoke up in support of net neutrality. The first 100,000 comments were delivered by us personally to the BEREC office in Riga. More protests followed in Bonn, Brussels, and Barcelona. With this overwhelming support and constant advocacy from civil society, journalists, academics, librarians and startups we acheived this great success.